Sautéed Sole with Lemon and Butter, Thyme for Cooking easy gourmet dinner. 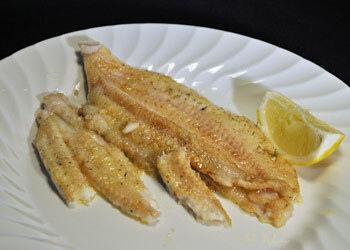 You can substitute any flat fish for the sole - tilapia, walleye, etc. Sole is very thin, so you may have to cook a thicker fish a few minutes longer. This is somewhere between a soufflé and a pudding. 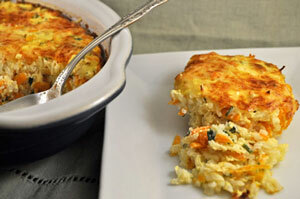 The carrots retain their texture and add a slightly sweet flavor to the rice. Cook rice in chicken stock. Peel carrots and shred using medium holes on the box shredder. Add milk, yogurt and herbs, whisk to combine. When rice is done, stir in the carrots and let sit for a minute to cool slightly. Add the rice and carrots to the eggs along with half of the cheese. Stir well. Lightly oil a glass baking dish (1 qt, 1 litre). Spoon carrot-rice mixture into dish, sprinkle with remaining cheese and bake, uncovered, 400F (200C) for 30 minutes.